Hard at work, signing and numbering the books. I’m actually much better looking than this in real life. If you should happen to meet someone who claims they know what’s going on these days with publishing, run the other way. No one knows. If anyone might know, it might be me, but I’m telling you I don’t know. Therefore, no one really knows. And there certainly is no secret. When first there were computers and clumsy dot-matrix printers back in the early 80’s, it didn’t seem to change much, and so it was business as usual for writers for a few more decades. We carried on the same as we did when we were typing. It seems to me (another way of saying I have no idea what I’m talking about but I’m going to say it anyway) that not a lot of attention was paid to printers in the early days of computers because the theory was that we would soon become a “paperless society.” That’s what they told us and we believed them. I don’t know how many trees I’m personally responsible for slaughtering since then, but probably a small forest. And yet, at the same time, they weren’t entirely wrong, these experts. The fact that you are reading this post electronically, as we say, is proof of that. The one area of printing that befuddled the experts from the beginning was the book industry. Rather than roll over and die, it seemed to flourish in the electronic and later digital age. It seems to me (again, no idea, just saying) there were two (at least) reasons for this. For one, those of us in the literary community supported the industry as well as we could in the best way we could, by buying books. I know so many people like myself who own a Kobo or Kindle and an iPad or other tablet who still (and always will) prefer the “real thing” as it were. And the book industry responded by creating nicer books. It’s true. Books, as physical entities, as artifacts, are much nicer now than when I was a student of literature in the 70’s and 80’s. While I’ve been hard at work (not really, but you get my drift) publishing the work of others, I was recently rewarded with a publication of my own by an even smaller press than B House called 100 têtes Press, run by Calgary poet Paul Zits. 100 têtes is somewhat oxymoronically (I love that word) a chapbook press. All the books are created by Paul himself. The care he takes with typesetting and selection of papers results in very beautiful and unique books. He even sews them together on a sewing machine on his dining room table. Written, the name 100 têtes translates into English as “one hundred heads.” Spoken, the name takes on a second possible translation, namely “without a head.” The name, appropriated from Max Ernst’s 1929 graphic novel, La femme 100 têtes, reflects Zits’ own personal interest in collage-work and literary montage. From their materials, design and binding, reflected in each book’s unique presentation, is 100 têtes belief in the book as art object. But the name is also meant to emphasize the Press’ community-driven focus, made up of, simultaneously, one hundred heads and no heads. 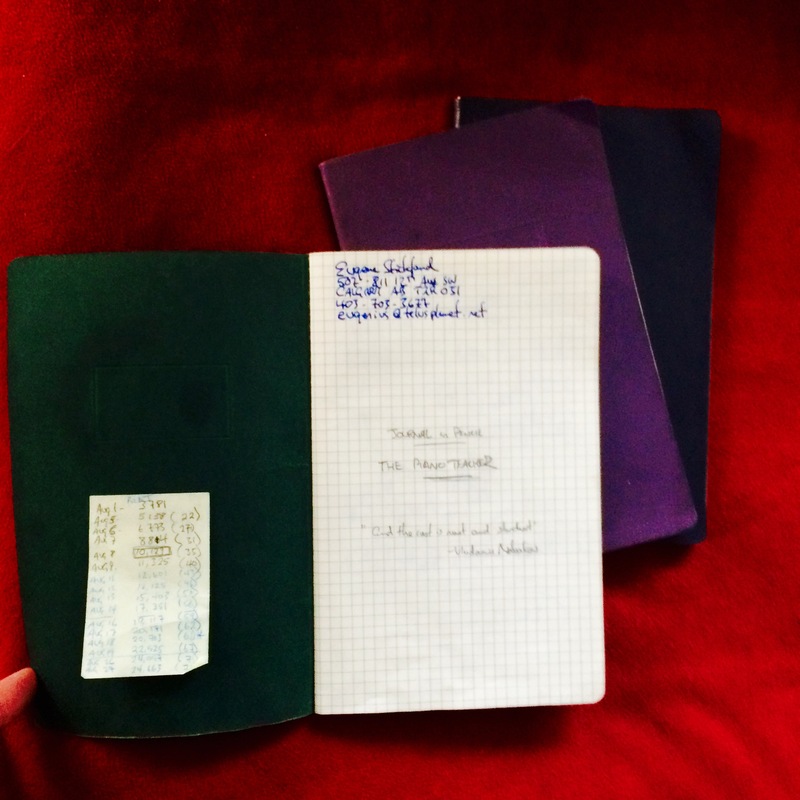 It is the mandate of 100 têtes Press to publish local writers, both new and established, of any genre, with an emphasis on experimental and conceptually resonant poetry, prose and visual art. So, here we see at least a trend in publishing – smaller runs of uniquely produced books which can quickly become collectors items given the small numbers involved. The problem, as you can probably tell, is that no one makes any money from this. That’s the problem as I see it when it comes to publishing in the modern era. As bad as it was for writers in the past, it only seems to be getting worse. The resume expands even as the bank account shrinks. What else is new? Because Paul is not in it for the money, as they say, his suggested price for the book was $4.00. 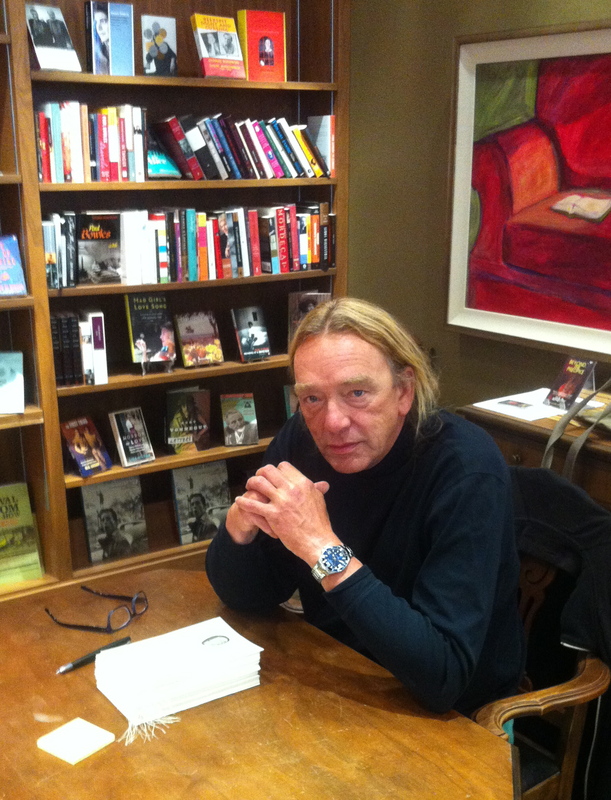 The day I signed them at Shelf Life Books (there’s a link to Shelf Life to the left – that’s where you can buy a copy, or through me directly), manager Will Lawrence (always the sharp businessman) countered by suggesting a price of $8.00 per book. After much strenuous negotiation between publisher and book-seller, finally a compromise was reached — $6.00 a book! As I say, none of us is getting rich, but we at least have the satisfaction of bringing a funky new book into the world. The peeling letters on the awning indicate that even the owners didn't care about this place. 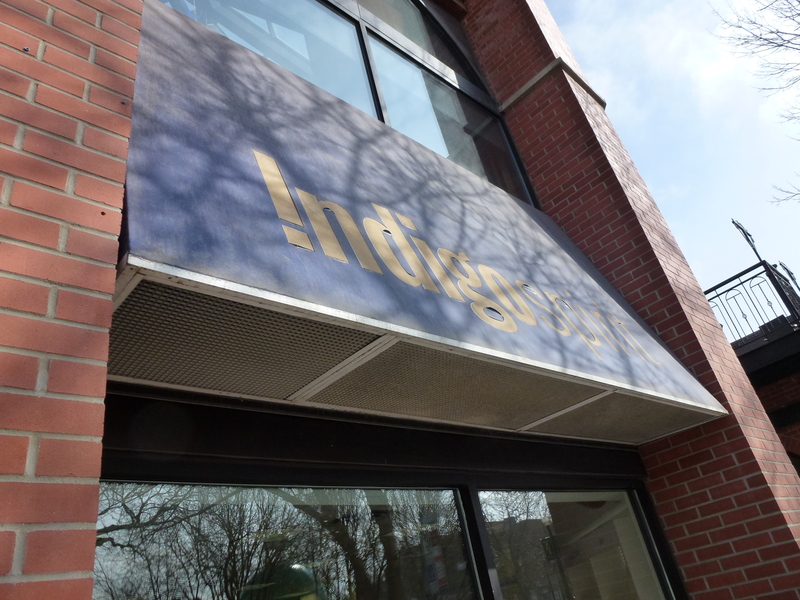 The Indigo Spirit store in Mount Royal Village has closed and few will mourn its passing. It’s hard to say now if it was a matter or arrogance or ignorance, probably a bit of both, that put landed the country’s biggest chain of bookstores, where they presumably know what they’re doing, in one of the best locations in Calgary and yet managed to fail and fail miserably. And so now they are packing up the last of their remainder books and stealing away. The beast is dead and it died not even with a whimper. A few blocks to the south of Mount Royal Village – which, it must be noted, seems to have some sort of curse on it, as it seems to be a magnet for failing enterprises – is one of Canada’s (ie, the world’s) wealthiest and most literate neighbourhoods. All around MRV to the north, east and west are apartments filled with students, artists, seniors, in general people who like to read. One block west is Caffe Beano, one of Calgary’s most literary cafes, certainly the only one with two poetry anthologies to its credit. Had anyone from Indigo ever bothered to sit in Caffe Beano for a few hours and check out what we were all reading, they might have fashioned a more relevant inventory and sold a few more books. Instead, it came to be known as the book store that had absolutely no books in it of interest to anyone. It was worse than what you might expect to find in a far flung suburban mall at the end of the earth. All that said, this is no great victory, it’s just a regrettable failure. I have to admit I managed to find a few books there over the years, most notably one of my all time faves, The Imperfectionists by Tom Rachman. One of the clerks at Indigo, Blair, who became a friend over the years bought a copy for himself and we bonded on that. With the closing of the store, Blair is running back to Saskatoon, apparently having had enough of cowtown. The staff was great and I wish them all the best of luck. They were involved with a doomed enterprise and they all knew it, but they soldiered on. And so Indigo Spirit is gone. Its passing will go without notice, other than this one. In the words of one of my favourite playwrights, Michael O’Brien: See ya. Hates to be ya. 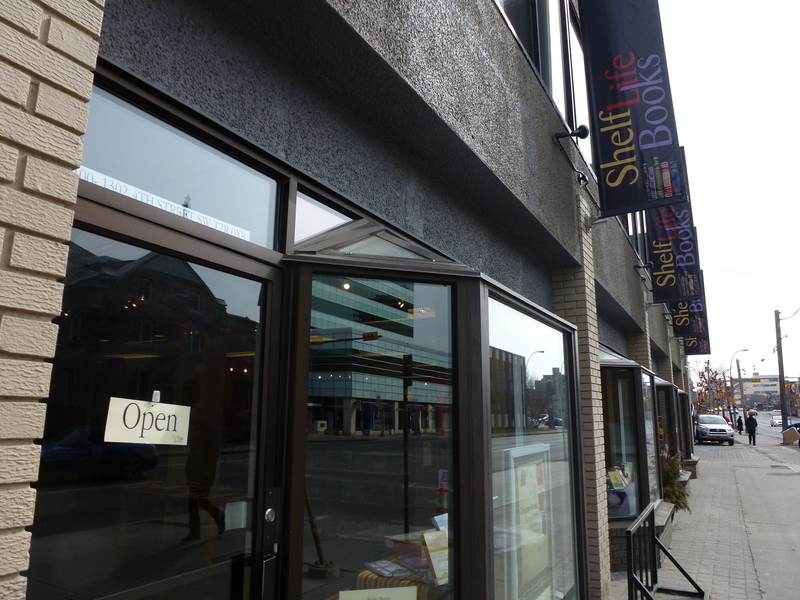 Shelf Life at the corner of 4th Street and 13th Avenue SW: open for business. All is not lost in the hood, however, as for the past few years we have been blessed with a truly wonderful independent book store, Shelf Life Books (a link can be found on the left hand side of this page). Shelf Life is for those of us who live on the south side of the Bow River what Pages in Kensington is for those on the north side. (This isn’t an absolute, obviously. Most of us who have the book habit frequent both places quite happily.) Here the inventory matches the sensibilities of the people in the neighbourhood it is found in, just a few blocks east and a few blocks north of the now defunct Indigo. Readings abound. Books are launched and prominently featured. Local authors (like me) can be found on the shelves (as it were). They take their place in our community seriously. In fact, just yesterday I popped in and spoke to Will, one of the owners, about launching my volume of poetry, Nocturnal Emissions, in the fall. No problem. I just have to finish writing it! Last year when Robert Kroetsch passed away, an evening of readings and tributes was held, allowing those of us who knew Robert (he edited an anthology of short stories for Coteau Books which contains my first ever published work) some sense of closure. In these uncertain times, these troubled times in the publishing world, when who in their right mind would open a book store, we celebrate the continuing presence of Shelf Life in our community. So we lost one book store that had no connection to the neighbourhood it was located in, that showed no desire to get to know any of us; yet we retained a good locally-owned literary book store and cultural centre that constantly brings together the authors and book lovers who live and work in this part of town and beyond. It’s another reminder to support our local businesses, our friends and our neighbours. Clearly this is exactly what is happening in South West Calgary. In this particular case, one can’t help but think that for once, the good guys won.